Josh Brolin has come a long way from The Goonies, Thrashin' and the bad guy of the week opposite Johnny Depp in a killer episode of 21 Jump Street. And right after he's finished throwing a moon at Earth's Mightiest Heroes in Avengers Infinity War, Brolin will step away from the Marvel Cinematic Universe to mix it up with Fox's world of merry mutants in Deadpool 2. Hollywood rights issues are keeping X-Men related characters from interacting with the rest of the Marvel Universe onscreen, but that can't stop our favorite actors from crossing over as different characters. Ryan Reynolds started teasing the cinematic debut of Cable in the post-credits scene attached to Deadpool, the years in development surprise box office smash that took meta-humor and R-Rated anti-hero action comedy violence to previously uncharted heights. Remember that Ferris Bueller inspired bathrobe riffing in that post credits scene? Plenty of audiences actually cheered at the mere mention of Cable's name. So why are so many of us comic book fans excited to see Cable in Deadpool 2? Are you unfamiliar with the big gun sporting time traveling telepathic mutant soldier? Need a refresher course on what makes him so freaking cool? Running out of ways to keep busy while we count down to June 2018? For those who aren't quite in the know, we're breaking down 10 things you should know about cable to get you psyched that he's In Deadpool 2. The creator of Deadpool is behind Cable too. While legendary X-Men scribes Chris Claremont and Louise Simonson certainly had a hand in his creation, Cable's look, feel, and vibe came courtesy of Rob Liefeld, the hotshot artist who later cofounded Image Comics. Liefeld co-created the Merc With a Mouth, too, together with writer Fabian Nicieza. Both characters made their respective debuts in different issues of the X-Men spinoff series, New Mutants. Cable is a "man of action," whose methods and leadership style differ greatly from both Professor Xavier and Magneto. This is because Cable comes from a possible future. A bunch of A-List actors desperately wanted the role of Cable. Kyle Chandler was high on the list for Deadpool director Tim Miller, though the Friday Night Lights star's prospects seemed to vanish when Miller exited the project. His replacement, John Wick director David Leitch, didn't waste any time when it came to sitting down with A-list stars who could be his Nathan Summers. The one and only Brad Pitt, who is anyone's definition of A-List, came close to playing Cable, even going so far as to meet with Deadpool 2's director. Ultimately, the project didn't work with the actor's schedule, though it seems like he's bound to suit up for some kind of Marvel or DC related property eventually, right? There was talk of Michael Shannon stepping over from the DC Extended Universe, where he played General Zod in Man of Steel and General Zod's corpse in Batman v Superman, though obviously that never came to fruition. Liam Neeson, who played Batman villain Ra's al Ghul in Christopher Nolan's Dark Knight trilogy, was mentioned by Deadpool himself in the first Deadpool flick's post-credits scene, though it was actually another actor from Zack Snyder's films who may have come closer. Deadpool and Cable creator Rob Liefeld took fancasting to new levels when he Tweeted at Russell Crowe, who actually responded. They had a whole public back and forth about it, with Ryan Reynolds even getting tagged into the conversation. Liefeld Tweeted out a pic of Crowe Photoshopped to look like Nathan Summers, before concluding his evening by writing, "Note to self, don't caffeine tweet @russellcrowe before nodding off to sleep." Speaking of social media campaigning, once and future Avatar villain Stephen Lang pushed hard for the role, posting photos of his Cable-esque physique and fan art. We don't know whether he ever actually had a shot, but one can only imagine the type of meta jokes Wade could have made about Lang's awesomely cowardly cowboy in Tombstone. Viggo Mortensen, legendary Remington Steele turned James Bond Pierce Brosnan, and David Harbour from Stranger Things were all talked about at some point, too. The coffee and contemplation loving sheriff from the '80s horror inspired Netflix series did end up with a huge comic book movie role though, landing the lead in the Hellboy reboot. X-Men's Cyclops is Cable's dad. In the comic books, Cable's real name is Nathan Summers. He's the son of Scott Summers, aka the X-Men leader better known as Cyclops. As for his mom, well, this is where it gets tricky. Technically his mother is Madeline Pryor, a character who is best described as a clone of Jean Grey, thanks to a series of convoluted retroactive continuity that rewrote some classic Marvel mythology as it relates to the Dark Phoenix Saga, a story we'll get to see play out soon in the X-Men movie universe. You know, again. Don't worry about all of the complicated timelines, though. Deadpool is refreshingly free from those kind of story restraints, focusing on the core of what makes these characters great and even mocking the head scratching continuity of the X-Men movies dating back to the 2000 original through the Hard R-Rated Logan. All you really need to know here is that Cyclops and sorta Jean Grey had a baby named Nathan who was sent to the future as an infant, returning to the present a grizzled war veteran with a bunch of super cool and comically large guns in tow. Cable's superpowers include telepathy and telekinesis. Cable's mutant abilities are awesome but largely put to use to suppress a techno organic virus threatening to overtake his entire body. But his skills as a soldier are no less impressive. In the comics, his birth was engineered by the villain Mr. Sinister; his journey through time enabled by his half sister, the time displaced Rachel Summers, and his childhood partly spent with two characters called Slim and Red, who were future beings controlled by the minds of Cyclops and Jean. Again, don't concern yourself too much with the finer details: just know that Cable has badass powers, badass skills, and a bad attitude from a messy childhood, a painful and often debilitating sci-fi infliction, and a lifetime of war. Cable is from one possible X-Men future timeline. There's a bunch of possible futures in X-Men lore, including the Age of Apocalypse, where Xavier's time traveling son accidentally killed his father setting off a chain of events that resulted in the villain Apocalypse ruling the world. In that version of the timeline, Nathan Summers becomes the mutant hero X-Man. The Nathan Summers that becomes Cable is from no-less of a war torn land, where he was constantly locked in combat with the villain Stryfe. When he shows up in the present, he's still got that warrior mentality, quickly setting about recruiting new soldiers behind him. Cable reorganized the New Mutants, Xavier's freshmen team of mutants who came up after the X-Men, into the paramilitary X-Force, together with Domino. We know that Fox is making a New Mutants movie and that Domino shows up in Deadpool 2, but how exactly all of this will play itself out onscreen remains an exciting mystery. Cable has an evil twin clone. Yeah, that guy Stryfe we mentioned? He was cloned from Nathan's own genetic materials. Yes, the son of a clone of Jean Grey has his own clone running around. While it would be cool to see Brolin pull a Jean Claude Van Damme style dual role in a battle against himself, we're more excited to see him with his greatest frenemy. Cable and Deadpool once shared their own comic book series. This is the biggest reason we're excited to see Cable in Deadpool 2. The dynamic between these two anti-heroes is the stuff that made all of the best buddy cop action comedy movies so great. The classic grizzled grump paired with the wisecracking near do well, each of them carrying some serious issues and seriously lethal skills. Cable once joined the Avengers team. Neither of these guys plays that well with others. In the comics, Cable has tangled with everyone from Wolverine to the Red Hulk. But would ya believe he was once a member of the Avengers? His stint with the team was predictably short, but it did happen. The SHIELD Helicarrier they couldn't call a SHIELD Helicarrier that was the scene of the climactic battle in the first Deadpool was the closest we've come to any sort of crossover between the MCU that's home to the Avengers and the mutant populated movies made by Fox. But hey, after Sony and Marvel made their Spider-Man deal, anything is possible, right? We could end up with that Brolin vs. Brolin fight after all, if some kind of deal happened before the release of Avengers 4. One last thing you should know about Cable to make you psyched he's in Deadpool 2. Josh Brolin's Cable looks a lot like the comics. If it ain't broke, don't fix it. Cable is awesome in the comic books and it seems like Hollywood has figured out that sticking close to the source material is a great way to ensure awesomeness onscreen. Remember the costume adverse days of Bryan Singer's first X-Men movie and that joke about yellow spandex? We now live in an era when freaking Rocket Raccoon runs around shooting things in outer space in gazillion dollar blockbusters. 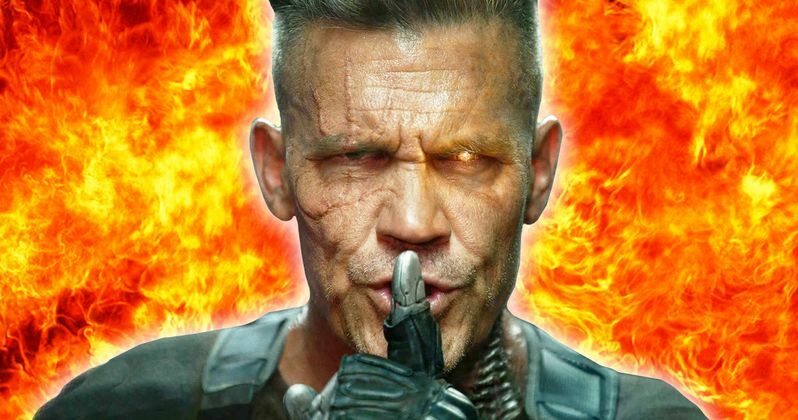 After the success of the super faithful take on Wade Wilson we got in the wonderfully received Deadpool following the tragically muddled X-Men Origins: Wolverine, the spot-on look and feel of Josh Brolin's version of Cable is enough to make us really stoked. We're confident Cable is in good hands.